Friday Afternoons launches NEW website! We are very pleased to announce the relaunch of the Friday Afternoons website. This will now provide you with easier access to our songs and resources. It also includes sheet music and performance tracks of ‘Seasons and Charms’, this year’s new set of songs which has been specially commissioned from Jonathan Dove and Alasdair Middleton. The Song Bank contains over 40 Friday Afternoons songs. In addition to ‘Seasons and Charms’, there’s music from Nico Muhly, Benjamin Britten and many others. You can filter these by level, composer and project year. Showcase is the place to upload and share your responses to the Friday Afternoons music. This could be a song that you’ve written or a recording you’ve made of a performance – anything that’s been inspired by our music, it’s up to you. The Who’s Involved section is where you can add your own activity to our interactive map, and browse through all the Friday Afternoons events that have taken place since the start of the project in 2013. We are planning to add even more new content to the website in the next few months – including interactive resources from Charanga Music – so keep your eyes peeled! If you spot any problems or find any glitches do let us know. Please send us an email. On Sunday the boys from the National Youth Choir of Great Britain performed the new set of songs for the Friday Afternoons project. The set of songs called 'Seasons and Charms' was created by Jonathan Dove with specially written texts by Alasdair Middleton. The songs include Mad Moon, Fire! and The Little Girl of Rain. The performance was signed by Dr Paul Whittaker OBE, conducted by Greg Hallam and accompanied by Ruairi Edwards. The new songs will be available from our website soon, but in the mean time you are able to download materials for more than forty songs from our website. Nick Tapper from ACE South East came to the Friday Afternoons premiere and wrote a piece for the Arts Council England website. We are featuring Cantate Youth Choir in our Close-Up series. Cantate Youth Choir were one of the Friday Afternoons Project Fund groups for 2015-16. 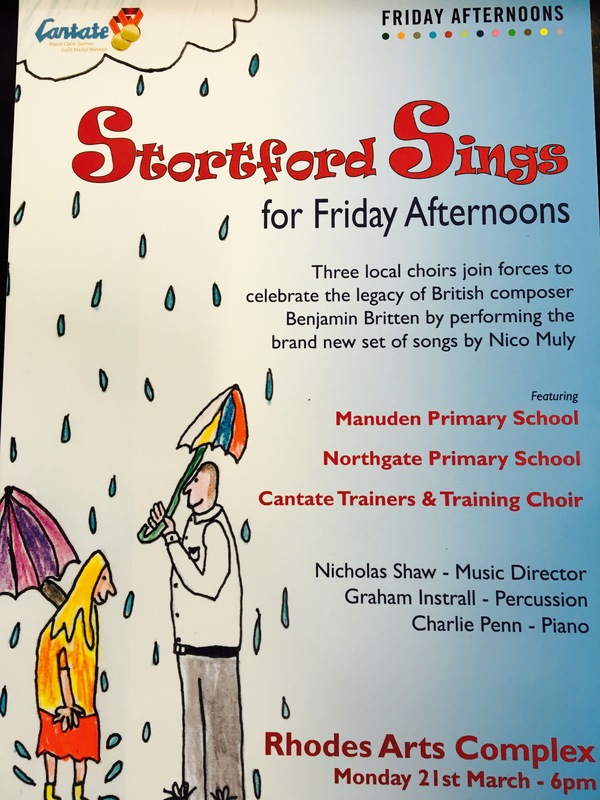 As part of their project they invited local primary schools, Manuden and Northgate, to join their Training Choir (and newly formed Trainers Choir) to have a day of singing with a culmination event for their parents to come along to in the evening. The students sang some of Nico Muhly's songs as well as some of Benjamin Britten's original music. Students also played specially written percussion pieces that were inspired by Robert Louis Stevenson's poetry. The concert was completely full, and a great success. Well done to everyone involved!